In recent years, chatbots have made their way into the mainstream, becoming an integral part of the way modern businesses interact with consumers. In this post, we’ll take a look at chatbots and how they are playing an increasingly important role in eCommerce. We’ll then dive into the ways that businesses can use bots across all channels. Chatbots are software applications that simulate human conversation. Customers can interact with chatbots much like they would with a human via SMS/text, web chat, social media or in a company’s app. Chatbots can be written to follow simple instructions such as to greet the customer with “Hi, how can I help you?” and ask for the customer’s name. Bots can also execute more complex processes based off of rules or keywords such as gathering order information, routing the customer to a different department, and displaying the customer’s order history to the agent. The earliest chatbots were simple systems that picked up keywords from a user’s message which triggered certain scripts. Responses may have come across as canned, but the mere fact that a user was chatting with a robot was novel in itself. In the 1960s, computer scientists at MIT developed ELIZA, which emulated a psychotherapist. Many individuals who used Eliza were convinced they were talking to a real person at the time. Though it was initially developed to show the superficiality of human communication, the developers were surprised by the large amount of feedback they received attributing human-like emotion to the machine. Chatbots have come a long way since then. Modern artificial intelligence has made it so chatbots are more helpful than ever, and natural language processing has seen major developments in recent years. Now, chatbots are instrumental to the way that many businesses connect with customers. Through Facebook, SMS, and web chat, chatbots can guide customers through every step of their path to purchase as well as provide intelligent customer support. Calling and emailing a company for pre-sales questions or post-sales support has gone the way of the VCR. Sure, there are some people out there that still use those channels, but for the vast majority, it’s not the first way people think of when they need to reach a business. Today’s connected consumers demand engagement that’s flexible, convenient, and fast. That’s why consumers are gravitating towards mobile means of engagement, where they can have more control over when and where conversations take place. The availability of smartphones and tablets mean that browsing, buying, and requesting support can happen anywhere there’s a mobile device available and consumers haven’t hesitated to use this freedom to engage businesses whenever and however is most convenient for them. Live chat for business, for example, is frequently used for customers to connect while they are browsing a company’s site. Further efforts to connect with customers on their own terms has led many companies to enable their landlines to send and receive SMS/text messages since many consumers prefer texting over phone calls. The mere thought of managing conversations over multiple channels would normally keep contact center managers up at night fretting about operations and agents worrying about efficiency metrics. Quiq’s messaging platform bring conversations from SMS/text, web chat, social, and in-app into one streamlined UI so that agents and managers have one place to manage every conversation. Unlike phone calls and emails that can only be handled on a 1:1 basis, messaging platforms, like Quiq, allow company employees to handle multiple conversations at once. We see employees handle 6 to 8 concurrent conversations at one time. Even with all the efficiency modern messaging platforms provide, human-only messaging systems are limited by things such as hours of operation and the amount of staff available. Enter the chatbot. Businesses are adopting chatbots for every messaging channel, including web chat, SMS/texting, and social channels as a way to route customers to the right department, or to an agent that can help them. Today, advanced chatbots, like those powered by Quiq, are predicted to handle 85% of customer service interactions by 2020, using artificial intelligence to meet the unique needs of customers in increasingly efficient and satisfactory ways, such as greeting the customer and gathering data to better understand the nature of their inquiry. eCommerce is perfectly suited for the features that chatbots offer since the entire customer journey — right up until delivery — primarily happens on mobile devices. Chatbots are available around the clock to engage customers with a welcome message, suggest products or promotional offers based on their browsing history, and help answer any questions that arise. Determining the type of question, whether pre-sales or post-sales, in order to route the inquiry to the correct team. Collecting information on what the customer is shopping for to narrow down a selection or suggest pages that customers should check out. Checking on order and shipping status. Helping customers troubleshoot a technical issue by asking questions to eliminate possible causes. Providing returning customers automated help with a password reset. 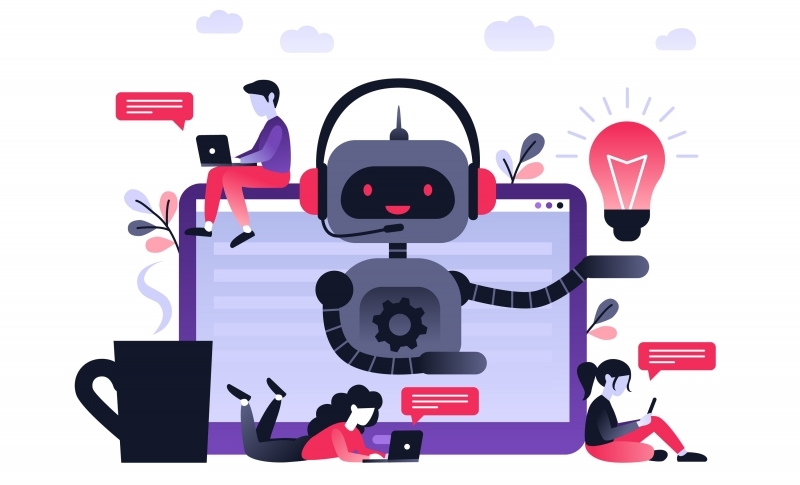 If the consumer makes an inquiry or gives feedback which is beyond the chatbot’s capabilities, it can seamlessly and immediately connect the consumer to an appropriate agent. The approach of having chatbots as the first point of contact, to gather data for human agents, maximizes efficiency and frees up resources while still maintaining the human element. In fact, chatbots can be used throughout the conversation, not just as the first contact. Human agents and bots can seamlessly transfer messages back and forth without disrupting the customer’s experience. In fact, Facebook Messenger, Apple Business Chat, and Google Rich Business Messaging are all popular avenues for connecting with customers. The more your eCommerce enterprise branches out into these engagement channels, the tighter your connection will be in the daily lives of consumers. Modern customer service is all about providing solutions to customers on their own terms. That means that consumers should be able to reach you whenever they want to, via the channels that they prefer. Quiq enables companies to engage with customers over multiple channels while using live agents, chatbots, or a combination of both. As chatbots become increasingly capable of complex tasks, the expectations that customers have when interacting with chatbots will only grow. Your customer service interface reflects the quality of your eCommerce brand as a whole, which is why it’s critical to use a platform that continues to advance along with the times. Quiq helps your brand stay ahead of the curve with advanced features such as agent performance optimization and real-time reports. Chatbots will continue to transform the way customers interact with businesses. By connecting with your customers via their preferred modes of text communication, you can ensure that you’re speaking their language and getting your message across. This means increased connections, higher sales, and improved customer satisfaction. If your brand is ready to explore the potential of a perfected chatbot platform, request a demo with Quiq today. Customer service can improve by combining business messaging and bots. The post Forrester Webinar: Connecting with Customers Through Messaging and Bots appeared first on Quiq. In this post, we’ll take a look at chatbots and how they are playing an increasingly important role in eCommerce. We’ll then dive into the ways that businesses can use bots across all channels. The post How Chatbots Are Revolutionizing eCommerce appeared first on Quiq. Customer service can improve by combining business messaging and bots. The post 5 Ways Chatbots Improve Customer Service appeared first on Quiq. The best business messaging solution use cases show how all businesses can benefit from implementing business messaging with these straight-foward examples. The post Top 5 Business Messaging Use Cases appeared first on Quiq. Business messaging is more than just order confirmations and shipping notifications. Engaging, two-way conversations with customers on SMS/texting, web chat, social media, and in-apps is the preferred way consumers want to reach businesses. The post 5 Ways Live Chat Drives Revenue appeared first on Quiq. What is Business Messaging and What Does It Mean for Your Business? Business messaging is more than just order confirmations and shipping notifications. Engaging, two-way conversations with customers on SMS/texting, web chat, social media, and in-apps is the preferred way consumers want to reach businesses. The post What is Business Messaging and What Does It Mean for Your Business? appeared first on Quiq. Think You Need An App For Your Company? Think again. Most of the things that companies build apps for can now be done with Messaging. Before you invest time and money in an app, read our latest blog post, “Do You Really Need An App?”. The post Think You Need An App For Your Company? Think again. appeared first on Quiq. Read the 11 live chat best practices that can help you deliver the ultimate customer experience. Make sure your chat solution delivers the kind of experience that invites customers to come back for more. The post Live Chat Best Practices for Exemplary Service appeared first on Quiq. Review these top stats for business text messaging to see how messaging powered by Quiq can quickly transform your business. The post Top Stats for Business Text Messaging appeared first on Quiq. Quiq Messaging helps TodayTix meet the needs of their customers by opening communications through the messaging channels customers find most convenient. The post Customer Spotlight: TodayTix appeared first on Quiq.